I don’t know about you, but for me, Summer means a lot of baby showers and bridal showers. I think I’ve reached that (ahem!) age. For the past few years, I’ve had the pleasure of co-hosting a few of these events and because of my very close relationship with food, I’m usually in charge of the menu. So, this was a baby shower/weekend lunch for my friend Kelly, who’s expecting twins. Now, Kelly’s a girl who mostly only eats pasta, chicken and veal. Sometimes she’ll eat pizza or gelato. Really, if it’s Italian, she’ll love it but otherwise, you just never know. But I did an Italian themed bridal shower for her and wanted to shake things up. I’ve also hosted a bridal shower brunch for her family in which I served a plethora of quiche. I needed to try something a bit different this time. Also, there were, I think 7 pregnant women in attendance, so it was requested that I avoid raw milk cheeses, smoked meats, and other such potential hazards. We served coffee and tea and punch but not wine or champagne. I realize that not everyone prescribes to a strict diet when carrying a child, but I wanted everyone to be able to enjoy at least most, if not all of the food available. And it was right around this point in the planning process that I felt like I was on some kind of strange contest where you have to prepare an entire 4 course meal for 30 people using only 5 ingredients… go! – A side of pre-sliced provolone was available if folks wanted to add to the sandwiches. – Cakes! One for each of the twins. Chocolate with chocolate mousse for one, and vanilla with vanilla cream and berries for the other. Here’s what I did: The salad dressings and sandwich sauces were prepared a week in advance but only applied immediately before serving. The quick breads were prepared earlier in the week. The salads, fruit platter and such were prepared the night before. The grilled chicken and veggies were prepared the night before the party and then the sandwiches were assembled the morning of. I prepared the sandwiches on baguettes, actually 6 very long Ace Bakery baguettes, and then sliced and served on platters at the party. 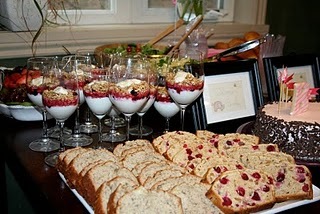 The yogurt parfaits were assembled mere minutes before the guests arrived. The cakes were store-bought but personalized just before the party. Ok… so now, let me put it to you. Have you ever planned something like this? What did you do for the menu? Would you have done something differently than me? Think I could have been more adventurous with the food? And part two of the question – have you ever planned food for a large event and learned any important lessons, like my lesson in yogurt calculation? Grilled chicken sandwiches with caramelized onions, watercress and a chilli lime aioli … on Ace Bakery baguette. This makes me so happy I wanna cry!